I like playing favorites, especially when discussing banana pudding and cupcakes. Thanks to sugar Sweet sunshine, my two favorites are under the same roof. I’ve praised their banana pudding before, and after a visit last week, I’m happy to report that copious amounts of ripe banana and Nilla wafer ensconced in rich, creamy pudding are still the norm. And for the first time, a cupcake made me speechless, namely the Ooey Gooey ($1.75, top), featuring moist chocolate cake crowned with chocolate almond buttercream frosting. For lovers of marzipan and almond paste, this frosting is your zen; it will ease your soul, align your spirit and have you moaning in delight. Make sure to try the seasonal chocolate chip trifle (above left, $4 small, $5 medium, $6.50 large) before it’s gone; it elevates dessert to another level by blending whipped cream and butterscotch pudding with pockets of crushed chocolate chip cookie. There’s always room for one more favorite, right? I am actually not a fan of their cupcakes but can’t get enough of the banana pudding or chocolate trifle. I once had 3 meals in one day consisting of only the latter two. worth it! I absolutely love Bread Pudding! I find that Magnolia’s (obviously known for their Cupcakes) has Bread Pudding that is out of this world! How you had it? If so, how does it compare? did you go on another 1 year vacation food guy? There definitely is room for a few more favorites! We took your suggestion and the banana pudding is absolutely amazing! Thanks for the tip! the pumpkin trifle is the best! 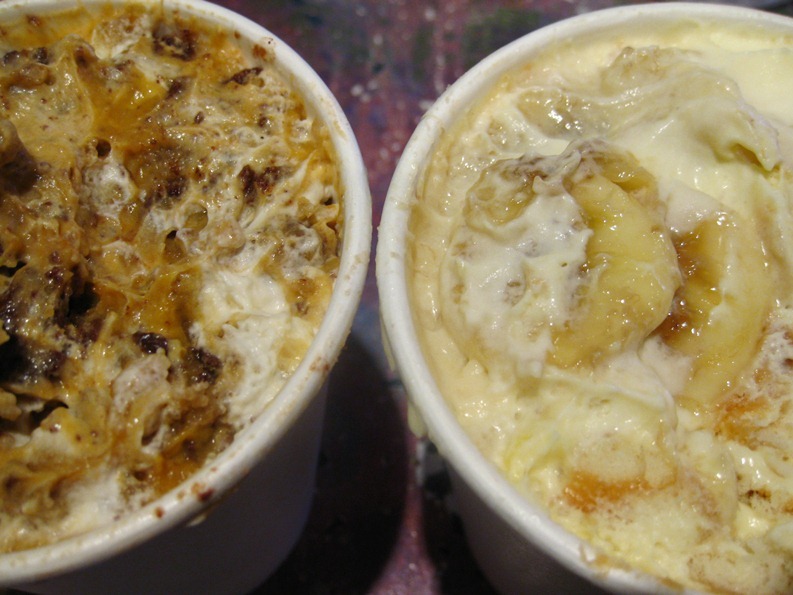 Sugar Sweet Sunshine is right around the corner from us and their bread pudding is out of this world! Their pistachio cupcakes are ahhhhh-mazing! Ok, the Ooey Gooey looks kinda gross and delectable at the same time. Trifle, you say? I’m there! Good to see you back posting consistently food guy! It’s only been 3 months, you’re due for 1 or two stupid reviews on turkey sandwiches before your next 6 month hiatus! 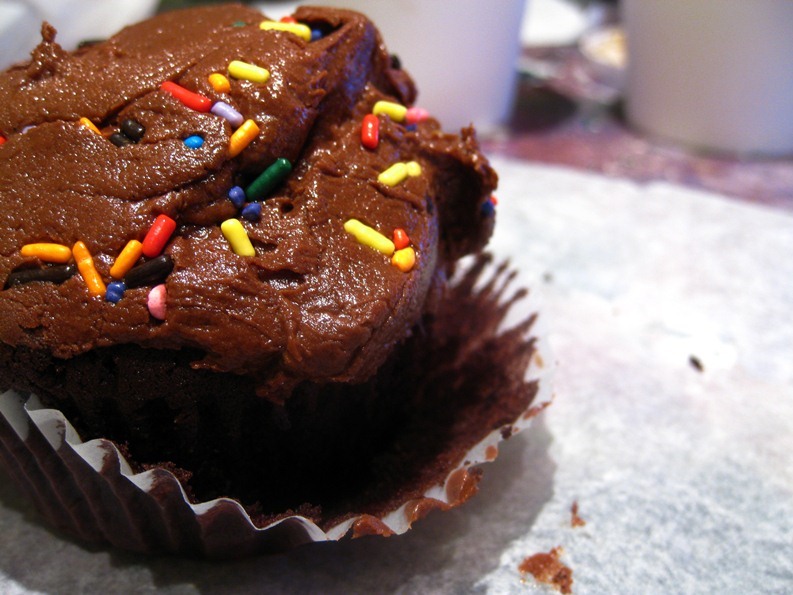 My god, that cupcake is amazing. That picture literally got me to go here for the first time just so I could try it – it didn’t disappoint. i am so going to try their banana pudding. i love magnolia’s even though it made me barf once…well, i think it was the combo of the evening of cajun at the delta grill followed by a touch of lactose intolerance maybe? can’t wait to try this. thanks for sharing! i am new to the cupcake scene. i have tried magnolia and billy’s bakery so far and i hate to say it, but i wasn’t impressed. i guess it’s maybe all about the buttercream frosting? that is good, but i found the cakes to be on the dry side. maybe i am old school, but just give me some homemade duncan hines box mix cupcakes over magnolia. i will have to try a cc here, but marizpan and almond paste aren’t my things. just too strong and overwhelming for me. You should also check out Sweet Revenge for their peanut butter cupcake (link) or Molly’s Cupcakes, a new place in the West Village that stuffs their cupcakes with everything from Blueberry cheesecake to cookie dough! stuffed cupcakes? exsqueeze me?! sounds right up my alley. thanks for the tips! I have been preaching Sugar Sweet Sunshine for years now, I’m so happy you like them just as much! I have gotten all my friends hooked, the pistachio and pumpkin are my absolute favorites!